There are always times you come to amazing moments or scenes in your life and want to share your joy with friends and family. Why not take out your iPhone, iPod touch or iPad to photograph or record those moments anytime anywhere, and let us, mediAvatar iPhone Photo Transfer, help you share, backup or transfer those fantastic photos and videos in your iPhone, iPod touch or iPad. Not only a photo to computer transfer for iPhone, iPod touch and iPad, mediAvatar iPhone Photo Transfer can also transfer photos and MP4/MOV videos from your computer to iPhone, iPod touch and iPad, and even share them among these devices. Want to manage, backup, convert, transfer all media files for your iPhone? Check more about iPhone Software Suite Pro. Share your photos shot by iPhone to your computer for backup or share with your friends and family in one click. Transfer your favorite photos from computer to iPhone to designate them as your iPhone wallpaper or take them wherever you go and show them to your friends. Transfer MP4/MOV videos in your iPhone, whether shot or downloaded or puchased, to your computer or iTunes fast and vice versa. This iPhone photo transfer applies to all iPhone, iPad and iPod models, meaning that you can share photos and videos among all of them. 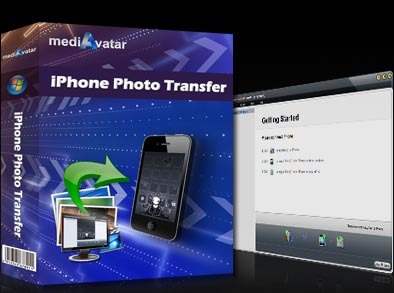 This photo transfer supports connecting and managin the photos and videos in all iPhone/iPod/iPod touch models: iPod Touch, iPod Touch 3, iPod Nano 5G, iPod Nano Chromatic, iPod Classic, iPod Shuffle, iPod Shuffle 4GB, iPod Video, iPhone 5. Create, rename, copy or delete photos in your iPhone albums and manage them more easily. Choose your favorite photos as you album covers and show your photo albums in a dazzling way. Available in English, German, Spanish, French and Italian languages.